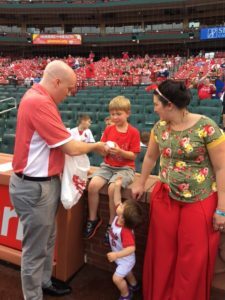 On May 19, Catholic Charities held its Go to Bat for Kids Night at Busch Stadium where nearly 2,000 children from St. Louis and surrounding areas enjoyed a memorable evening at the ball park. 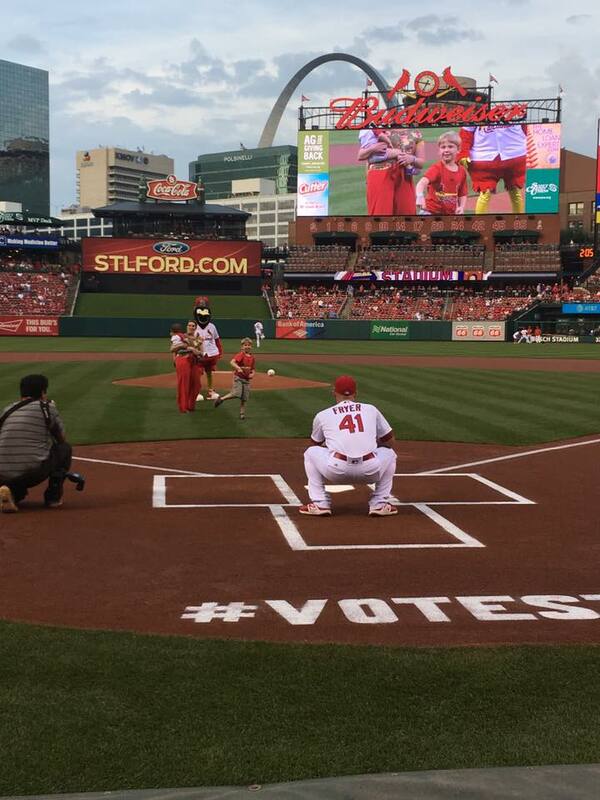 This night was truly a magical moment for six-year-old Landon DeIuliis, who had the honor of throwing the ceremonial first pitch. “What a remarkable young man and an all-star pitcher! 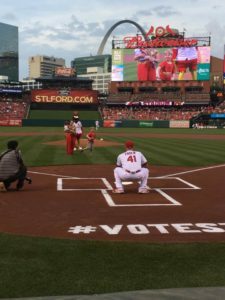 It was an incredible moment to be on the field with him and his family. We are so grateful for the generosity of our donors to make Go to Bat happen for these kids,” said Brian Thouvenot, Chief Development Officer of Catholic Charities. 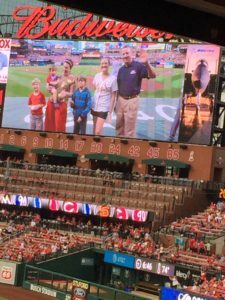 This field of dreams moment was also cherished by his aunt and guardian, Sally DeIuliis, as well as Cortney Dollens, Child Therapist at Queen of Peace Center, who has counseled the family from the beginning. Queen of Peace Center is a member of the Catholic Charities Federation, which provides behavioral healthcare to woman with addiction and their families. Because of Sally’s courage to seek support at Queen of Peace Center, this was both a celebratory moment in her recovery and memorable moment for her and her children. As Landon patiently waited to step onto the field, the family shared their success story. With the support of Queen of Peace Center, Sally entered the facility to break the cycle of addiction and to begin a new life with her children. “It is just a great feeling to be here this evening to watch Landon have this incredible moment. I am just so grateful to Queen of Peace Center for treatment and continued recovery and support for me and my family,” said Sally. Today, Sally is on a new path, sharing her experiences with addiction to high school students, focusing on career opportunities, and raising her boys. Catholic Charities continues to be by her side, offering continued legal support, family counseling and career training services. With a smile beaming from her face, Sally watched Landon launch a strike down the middle. What an incredible evening for the family! “It is truly a magical night for Landon. He’s quite an amazing kid. I am just so honored to be here to share in this special moment with Sally and her family,” said Cortney Dollens from Queen of Peace Center. 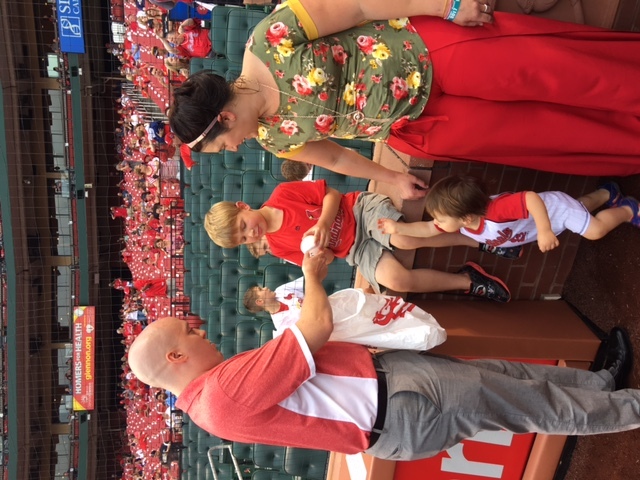 Over the past 16 seasons, including this special night, more than 32,000 children have experienced the joy of a Cardinal game through the generosity of the St. Louis community. 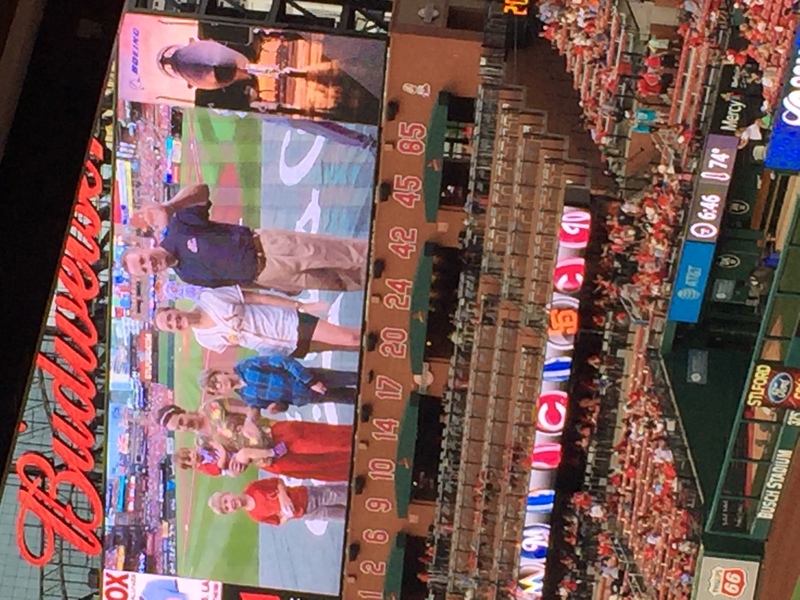 Thank you for giving Landon, his family, and nearly 2,000 children their field of dreams moment on Go to Bat for Kids night. Queen of Peace Center is a family-centered behavioral healthcare provider for women with addiction, their children and families. The Center offers a variety of treatment options including: a gender-specific recovery program for women and children, therapeutic daycare for their children, an early childhood development center, permanent and transitional housing for women and their families and an early-intervention and prevention program for adolescents. You can learn more about Queen of Peace Center at http://www.qopcstl.org/.